I am writing a new book on operating systems for Novatec. On the chapter three I get into the Linux kernel, which will be covered in detail in the next chapters. In a certain point, I tell the readers the following history while they download the Linux Mint image. 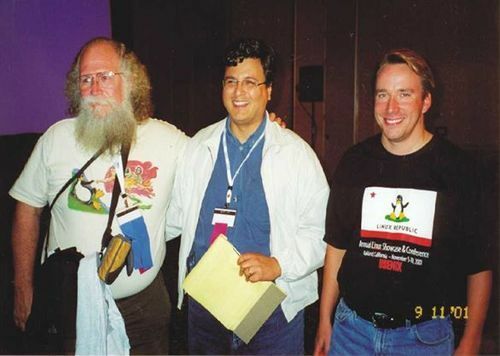 In 1999 I participated in the the first Linux World Conference and Expo. There I met in person several icons of the free software world, including Jon “maddog” Hall, Richard Stallmann and, of course Linus Torvalds. Ironically, a couple years before Compaq had bought the company I worked for, Tandem Computers and also Digital, the company “maddog” worked for. I knew “maddog”, of course! He was already a living legend in the free software folklore. He, obviously, didn’t know me. However, the fact we have been “coworkers” was a good ice breaker and the beginning of a friendship I value deeply. When we see Linux running on smartphones into its Android incarnation, we must credit “maddog”. In 1994 he gave Linus Torvalds a computer based on an Alpha 64 bits processor, manufactured by Digital. This may seem trivial nowadays. At the time it wasn’t. Computers were still quite expensive. A 64 bits computer was a luxury. They were used mostly by enterprises who processed huge amounts of data and transactions, such as banks, insurance companies and stock exchanges. At the time, enterprises were starting to migrate from a mainframe (large IBM computers) scenario to a distributed, networked client-server environment. Jon “maddog” Hall was witnessing the beginning of the commercial internet and he believed not only the processing power should be distributed but also people technological knowledge should also be shared. This could change the world into a better place, for all of us. Instead of just philosophizing on top of this ideas, he acted on it and convinced Digital’s decision makers to give Linus Torvalds a high-end computer. Linus ported Linux to the Alpha 64 bits architecture. This was the first port of his operating system out of the x86 Intel architecture. This was what allowed, later, your smartphone to run Android. Thanks to “maddog”! "Maddog" is the proud godfather of two of Linus and Tove Torvalds’ daughters. And they all live happily!